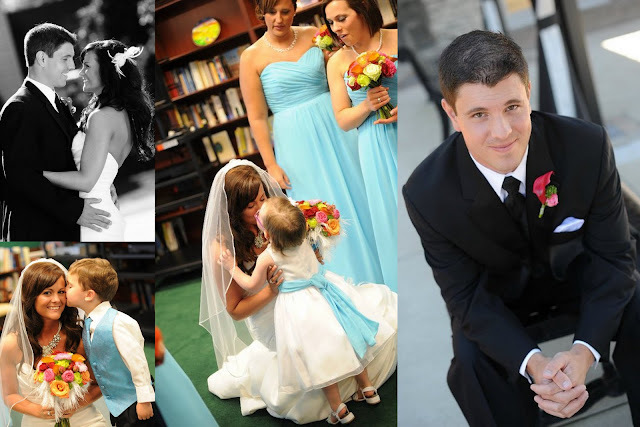 So, today I am sharing some of our wedding pictures. It is February 1st (crazy..don't you think?) which is the month of love..therefore, a perfect time to share them! 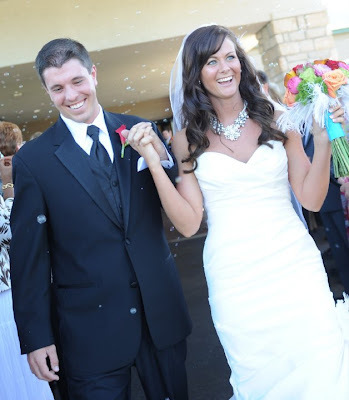 I didn't have my blog back when I got married and never got the opportunity to blog all about it, so this is fun for me to somewhat re-live the day and share with all of you. I will let the pictures do most of the talking, but for the record (like most brides), it really was the best day of my life. Wish I could live that day all over again. Please do not copy or use pictures without my permission. So beautiful! I just love, love, love your necklace...and your face. I wish I could relive my day too, so bad. 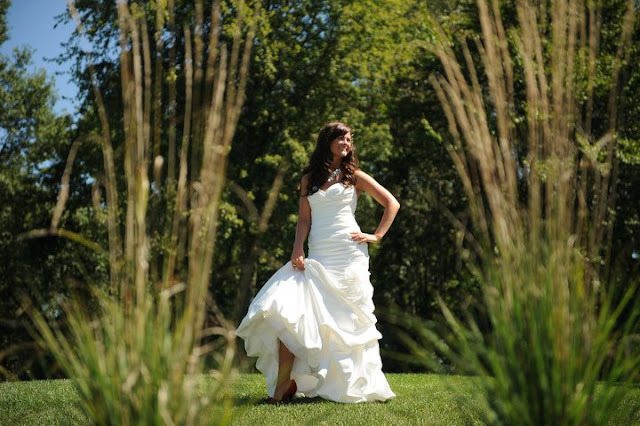 Beautiful bride, beautiful pictures... Looks like the perfect wedding! Where did you get your shoes?!?!! absolutely gorgeous wedding. you were a stunning bride! the dove picture is amazing. 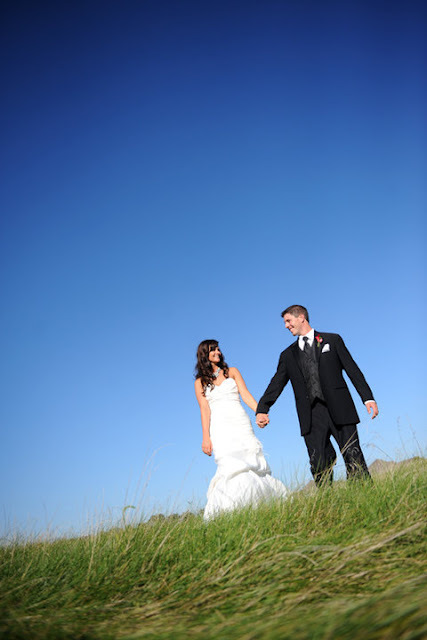 Your wedding day looks like it was amazing, and I am sure it was! I love the idea of the release of the doves. How creative and touching! We lit candles at our ceremony in memory of our family and friends who weren't there in person, but were shining down on us from Heaven! I just LOVE your bouquet...well, I love everything about your wedding. You're gorgeous! love the pic with us and the dove! YAY! 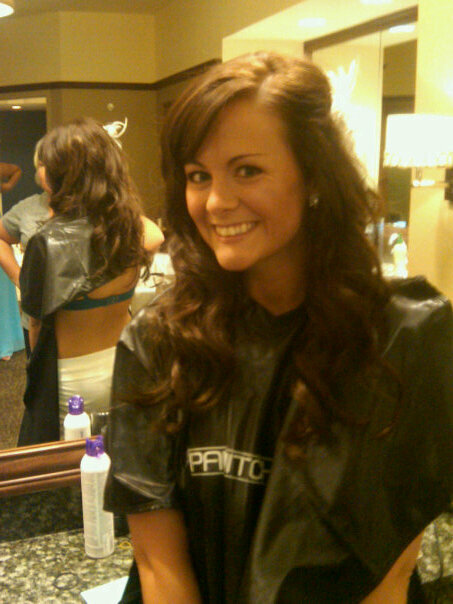 :) So pretty!!! I wish you had been a blogger when you got married so I could hear about every little detail. :) And I totally want to relive my day too. Let's all have a party and put on our dresses, and make the guys rent tuxes. hahahaha. I love that your wedding had so much color! Beautiful. I love the middle picture of you in the first set. 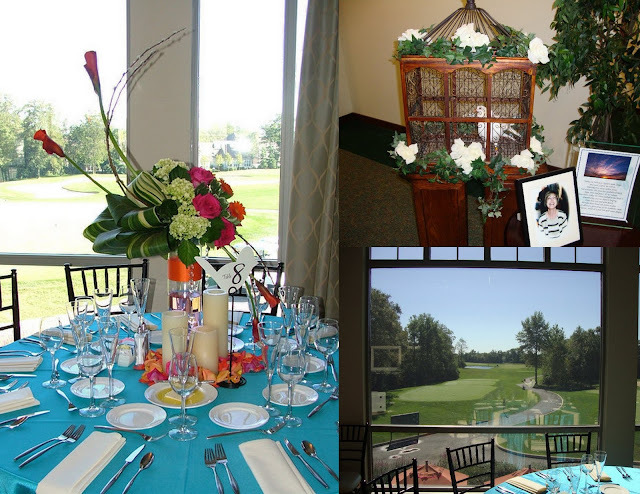 Was your reception at a country club? Where are the dancing shots? He he. Stunning bride!! So glad you shared this pictures so beautiful. And I acourse love your lil dog:) I just posted my dogs photos from her first photo shoot. love the colors and love that you let a dove free for your lost family members!! Love the dove release. We did a butterfly release. Oh, your wedding was absolutely beautiful! Love love love! I love your dress and the colors your chose! Your dress and flowers were amazing! You looked absolutely beautiful. What a beautiful wedding, and hubby definitely is a cutie pie - you make a lovely couple! Your wedding was gorgeous - so were you! I love the colours. your wedding was gorgeous! what a perfect day! 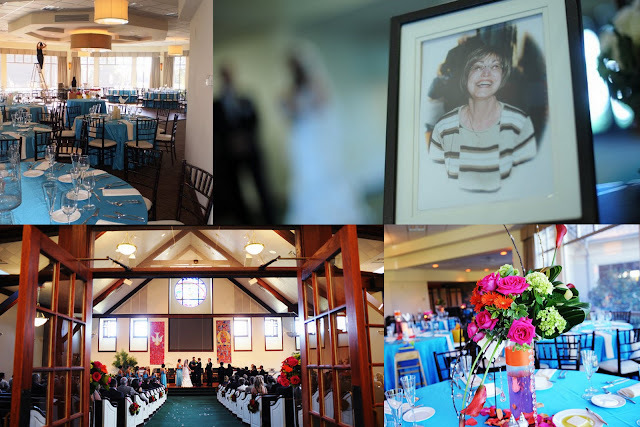 I LOVE your wedding photos! Gorgeous! Where did you get that necklace it would go perfect with my wedding dress! LOOOVVVe! TOO cute. I want boquets like yours.. got any details for me? I'll be getting married in July 12. 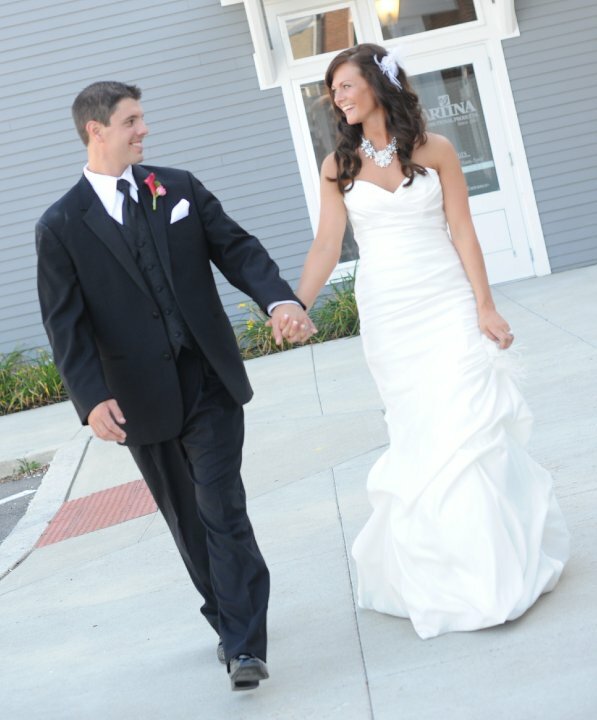 Additionally, my fiance is from Dublin, OH! Your pictures are fab! Looks like your day was perfect. :) Makes me even more excited to be a bride! What a GORGEOUS day yall were blessed with!! You looked stunning Katie! ugh this MELTS MY HEART!! i love the dove release pic! 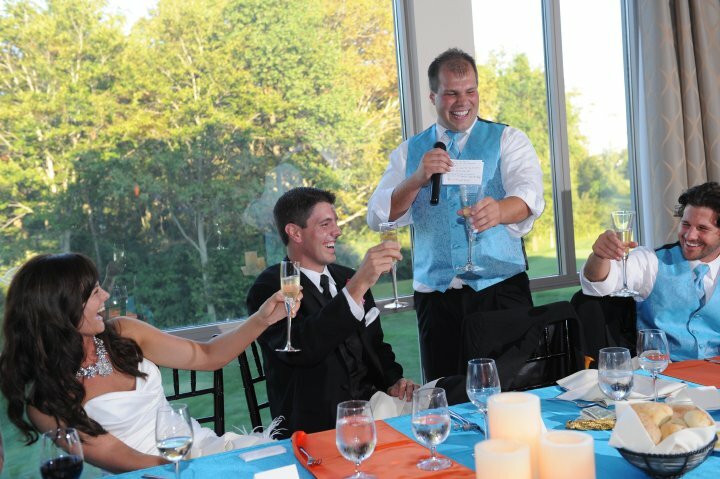 also the one of what it looks like the best man is giving a speech and y'all are laughing! you all look SO HAPPY!!! and could you have looked anymore gorgeous? what am amaazing amazing day!! Your pictures are absolutely beautiful! I'm getting married in a little less than 3 months, and I am just so excited for everything, the whole wedding day, and of course the marriage to follow. Wow, so perfect!! You are gorgeous!! Makes me that much more excited for mine in just over 2 months! Beautiful, and I'd like your hair please. You can have mine ;) though you might prefer to keep yours. Your pics are amazing, looks like a fabulous day! Love that you wore fun red shoes! So cute. 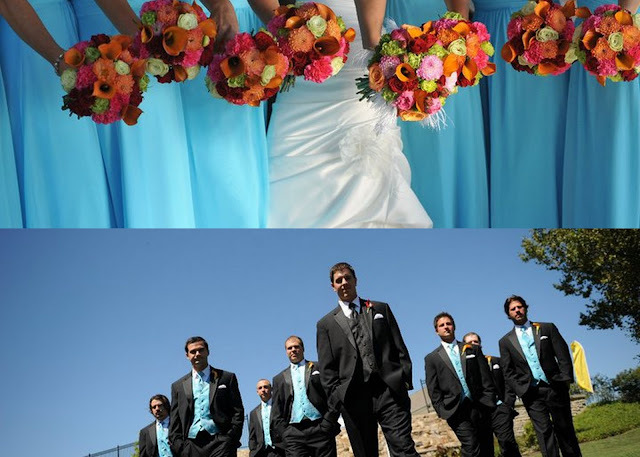 Love the color of the bridesmaid dresses especially w/ the contrast of the bright flowers. And love your necklace. Looks like your wedding was beautiful! Wedding Jewelry Question!! 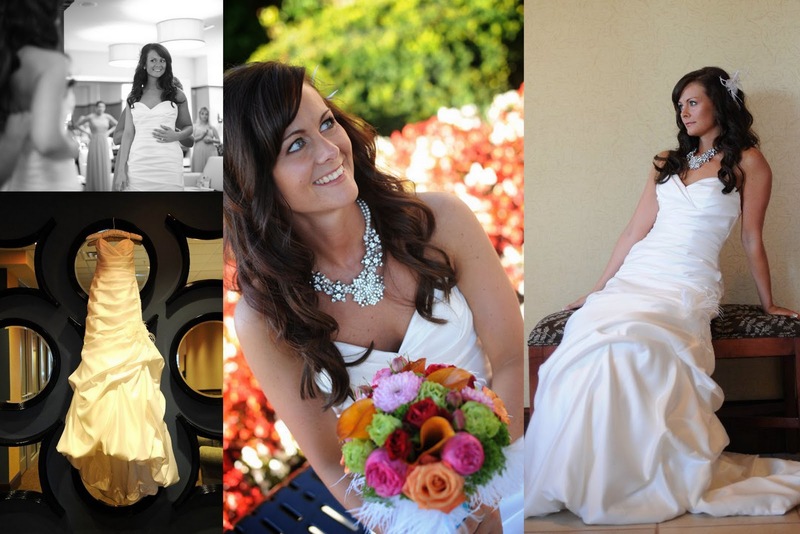 Where is your gorgeous wedding necklace from!!? I love your wedding colors. You looked beautiful!! What a beautiful wedding! 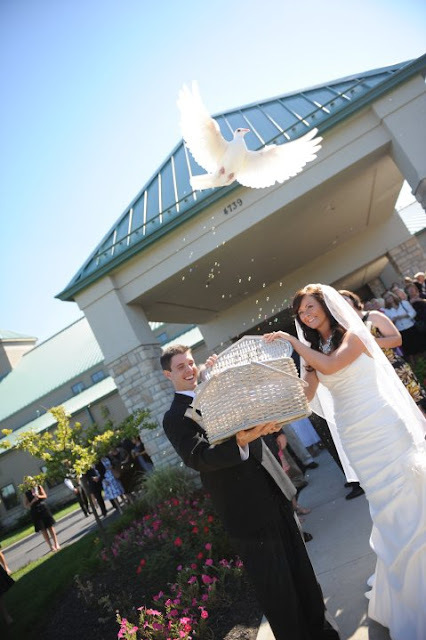 I absolutely love the dove release photo! What a great and unique idea. Beautiful pictures! 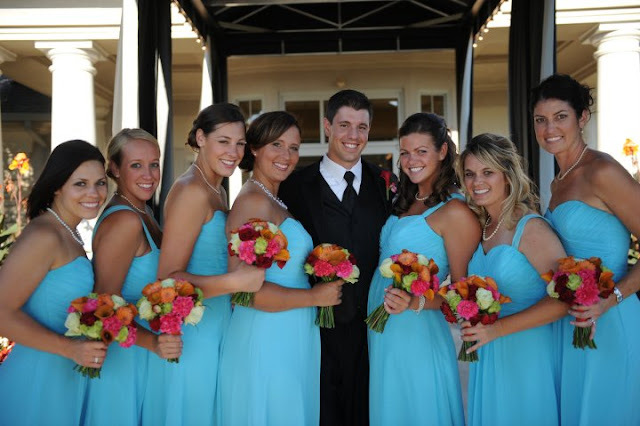 My bridesmaids wore a very similar blue. Love it! SUCH a GORGEOUS bride!! 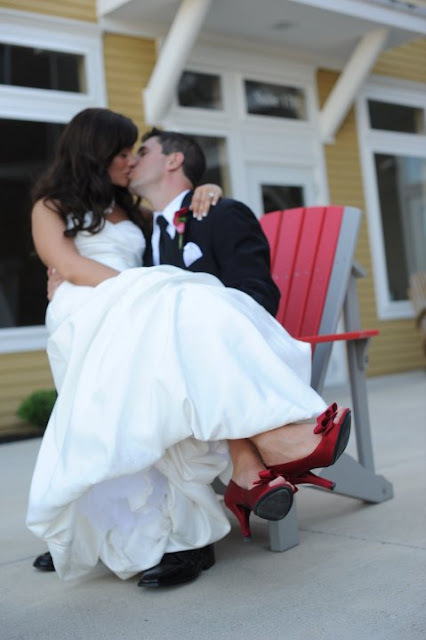 Love that picture of your red shoes of you on the red table, priceless! You were SUCH a beautiful bride!! Just stunning! I love the colors and details! New follower! I am absolutely drooling over your wedding photos. You were such a gorgeous and happy bride!!!!! One word: stunning! Mostly because you look so genuinely happy, but also because you're gorgeous :) Thanks for sharing these again! next... I have been looking for a cute camera strap for MONTHS, and because I am anxious and have zero patience, I already ordered one from there so thank you for the post!!! (Bare w/me I am new to blogging and am not quite sure how to respond to you!) Anyway, John Gemma is his name - he went to Dublin Coffman also. He graduated HS in 2006. His older sister Christina is closer to your age, but went to Worthington Christian so you may not know her! Do you know Lisa Werhan? Your wedding pics are gorgeous! Looks like it was the perfect day! Found your blog today! And loving it! you were a stunning bride! was your reception here in Columbus? it is a gorgeous setting! Stunning wedding! Love the bubble gum colors. Have fun one your trip with the BeautifulMess'. LOVED seeing your pictures, made me excited for my day!